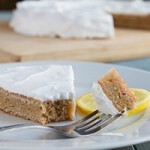 A light golden-yellow keto cake with a delightfully bright lemon zing! 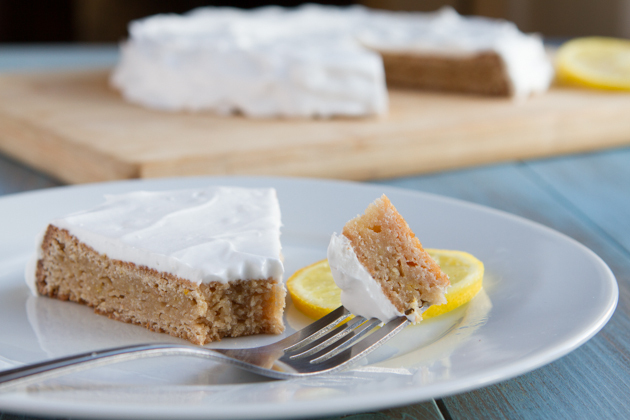 Single layer, dairy-free, egg-free, and keto cake with just 5 grams of carbs per serving. So, I made a cake. A low-carb, keto cake. Totally free from sugar (I used xylitol because it doesn’t spike my blood sugar as crazily as other “sugar-free” options), eggs and nuts. If you’re familiar with coconut flour, you know that it’s incredibly difficult to make an egg-free coconut flour recipe work correctly. Coconut flour requires eggs 99.9% of the time. Or at least, that’s what I thought until I discovered the magic of a gelatin egg. Yes, a gelatin egg. What’s a gelatin egg? It’s a mixture of gelatin and water that, when combined a specific way, acts exactly like an egg in baking and cooking. The key to making the perfect gelatin egg is in sprinkling the gelatin over the water in a saucepan and leaving it to sit at room temperature for 5 minutes before heating. As the gelatin sits in the water, it blooms, creating the perfect egg-like consistency once heated lightly. 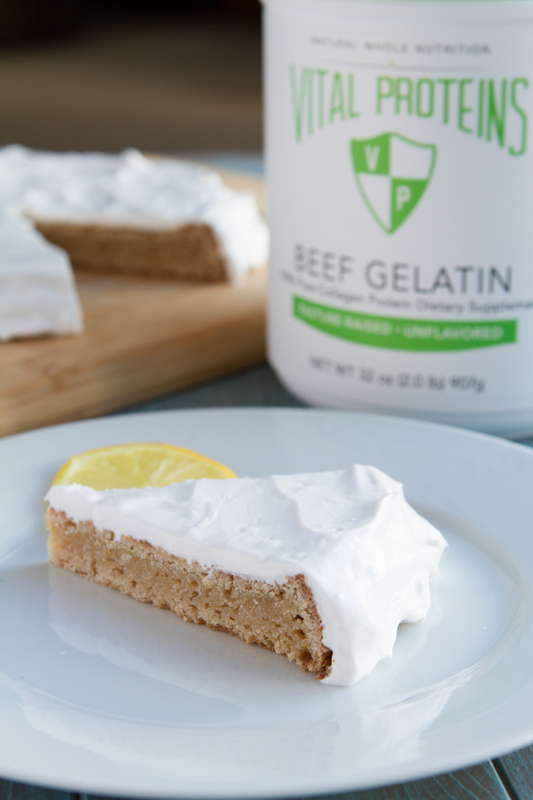 If you’ve been reading Healthful Pursuit for awhile, you know that I adore Vital Proteins Collagen Protein Beef Gelatin for its quality, tastelessness, versatility, and availability. I use it in my daily keto Rocket Fuel Lattes, add to keto soups, keto stews, keto bone broth, make keto gummies with them, and now I make keto gelatin eggs! Of all the gelatin I’ve tried (there have been a lot), I chose to share Vital Proteins with you because of three solid reasons. The first, it tastes good. Or rather, it tastes like nothing at all. Second, Vital Proteins products are high-quality and reasonably priced. And third, I know you can get it. Vital Proteins will ship your order right to your door. I recommend that everyone have a container of Vital Proteins Collagen Protein Beef Gelatin in their pantry, especially now that you can make keto eggs with it! Gelatin eggs are fabulous for keto cookies, keto pizza, keto cake, keto muffins… It’ll do just about everything you need it to do except for egg scrambles. That will not work. Let’s get to the full keto recipe, yes? 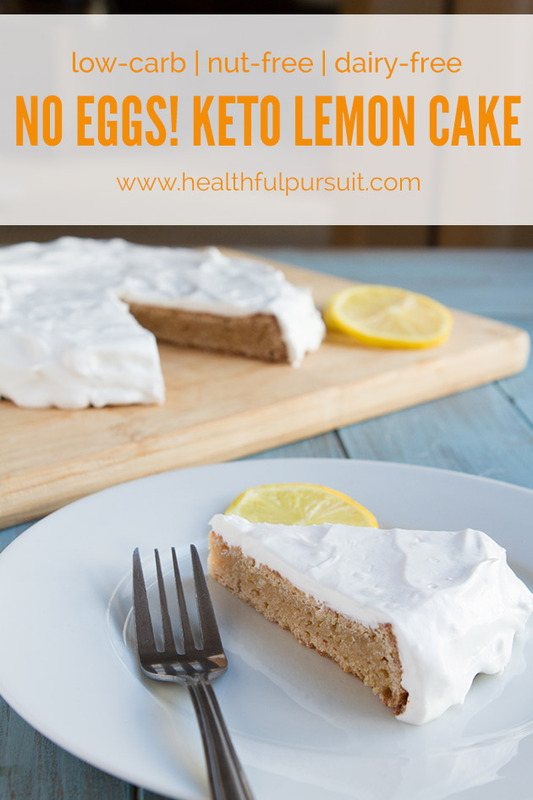 Single layer, egg-free, keto lemon cake with just 5 grams of net carbs per serving. Xylitol: you could use stevia baking blend or another sweetener of your choice, I’m sure. Although I haven’t tested it with this keto recipe. Resting time: it is so, very important that you stay patient with this keto cake and let it rest following the directions above. When the keto cake comes out of the oven, it will be gummy. It needs time to work its magic and become just perfect!